At LSBU, architecture students have their own dedicated studio spaces on the sixth and seventh floors of our Keyworth Building. The types of activities in our studios are very varied. Uses include 1:1 tutorials, hand-drawing group classes for first year students, seminars, presentations, model making, installations, and workshops. There are typically two or three tutors shaping the work of a small cluster of students; in the first year of studio, BA (Hons) Architecture students are taught together in a year group. After this students work in four vertical studios, and postgraduate students work in three vertical studios throughout their fourth and fifth years of study. Take a tour of the Architecture Design Studio. The space supports seminars, which are informal group-based presentations and discussions, and design juries or 'crits' (critiques), which are the students' opportunity to formally present their work to their peer group, studio tutors, and a panel of visiting guest critics. Crits are specifically designed to emulate the demands of professional practice, challenging students to develop the ability to verbally and visually promote their work as if they were presenting to a client. This helps build students’ confidence and communication skills, so they are able to articulately present a logical vision of studio design projects and taught course work. A strong portfolio with a specific and very personal identity, which is full of persuasive ideas beautifully represented, is like a passport. It provides the graduate with the ability to engage with the profession, and travel smoothly throughout their career. Technology workshops are an excellent example of the collaborative teaching happening in the design studio. 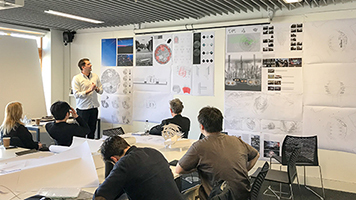 Architecture students present their work to a cross-disciplinary academic panel that includes construction managers and engineers for feedback. This gives students of architecture invaluable experience of teamwork, co-designing, interpreting and responding to challenges, ideas, and insights raised by professionals from other disciplines. Students take on a number of applied projects throughout their studies that are designed to enhance their core technical skills. They also gain exposure working in a cross-disciplinary manner that reflects the design process most commonly adopted in the sector, preparing them for the workplace after graduation. Studio culture is integral to training strong architects. It is of course about creating an inspirational physical space – and with amazing views of the London landscape ours is certainly that. However, studio culture is also about developing a teaching and learning style that resonates with an architect's future professional practice. Read more about our student facilities and our central London location.